The Motorola MC55 brings a new level of functionality and flexibility to pocket-sized mobile devices. 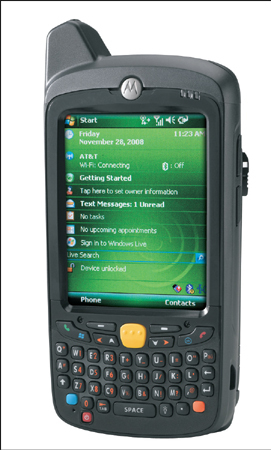 As the smallest and lightest Motorola rugged EDA, the MC55 packs the power of a cell phone, bar code scanner, camera, walkie talkie and mobile computer into a robust business class device with true consumer styling and ergonomics — and is designed to meet mobile worker, business application and IT requirements. This highly flexible product family provides mobile workers both inside the enterprise campus and out in the field with voice and data services needed to streamline tasks, increase productivity as well as improve customer response times — and customer service levels. A broad array of accessories enables easy customization of the MC55 to meet the unique needs of your business applications. And with enterprise durability, manageability, security and scalability, Motorola's MC55 easily meets the most demanding IT policies and mandates.